The inhabitants of modern Israel and Palestine have a long history of stubborn defiance in the face of outside threats and military oppression. 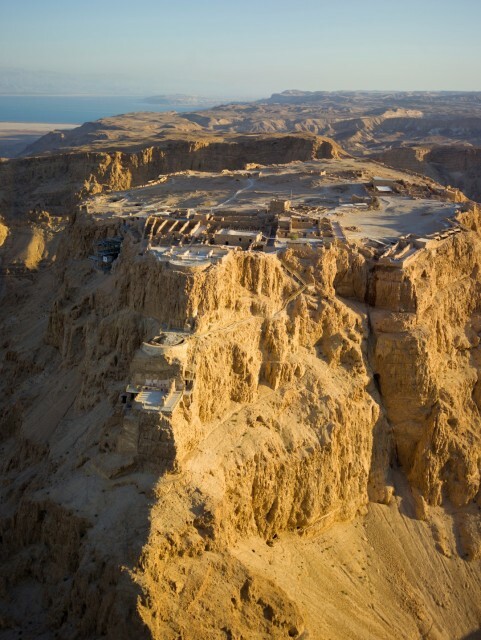 It’s a character trait thousands of years old, and can be seen as far back as the Roman Empire, in one of the most famous acts of defiance in ancient history – the Siege of Masada. In AD 66, rebels in the province of Judea rose up against the Roman Empire. It was a time of tumult for the region, full of new prophets and portents of doom. A period out of which would come both Christianity and a strengthened sense of Jewish identity. Prominent among the rebels were the Sicarii, one of many Jewish groups espousing violent resistance to Roman rule. The Sicarii earned their name for the curved knives which were their trademark weapon. The revolt saw some success at first, with the vital city of Jerusalem becoming a rebel stronghold. But the Roman army was a brutally efficient war machine. Jerusalem was stormed in AD 70 following a siege that saw many die at Roman hands. 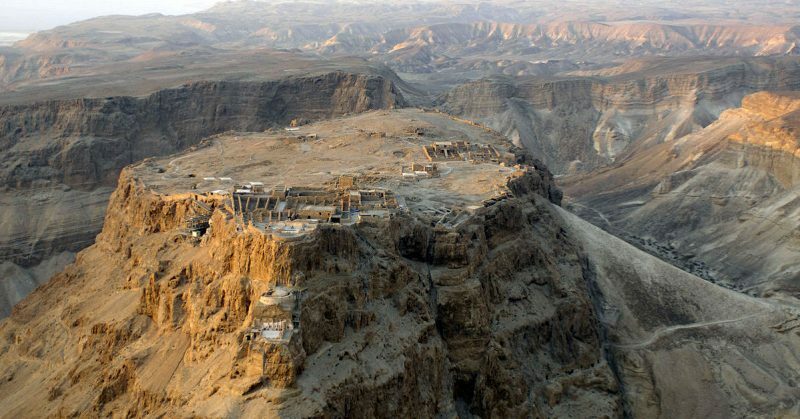 While the main thrust of the rebellion died at Jerusalem, some rebels hung on in strongholds such as Masada. 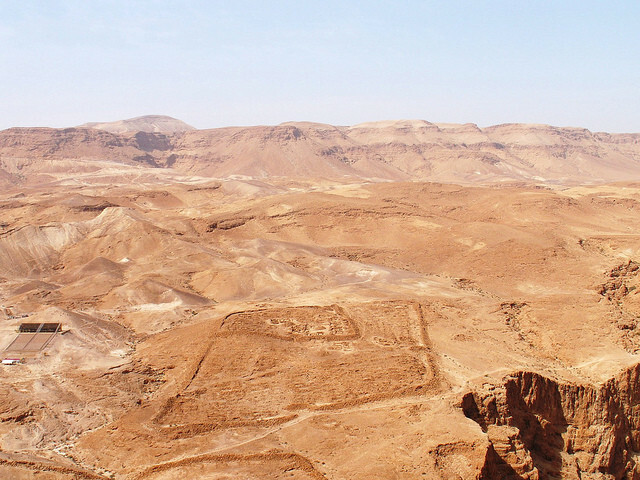 Masada was half a fortress, half a palace. Built by Herod the Great, it was meant to provide that ruler with a luxurious refuge to which he could retreat in times of crisis. The fortress was an incredible feat of engineering, possibly the most intimidating fortification any besieger could face. Built on top of a rocky, steep-sided hill, it could be reached only by a winding path on the eastern flank of the hill, a long and challenging route which would force attackers to approach a few at a time, leaving them exposed to attacks by the defenders the whole way up. In most cases, a castle which could not be assaulted could instead be taken by a protracted siege, cutting off the inhabitants from supplies and starving them out. But here again, Masada was well placed to resist any threat. Cisterns cut deep into the rock stored rainwater from storms. Large storerooms were filled with supplies. There was even some space on which to grow crops, providing the inhabitants with fresh food. Around 960 Judeans occupied the fortress when the Romans arrived. Not all of them were warriors. Entire families had sought refuge there, and a significant proportion of the besieged were children, the elderly and noncombatant women. Their leader, Eleazer Ben Yair, was a militant from a family with a history of such resistance. The force of soldiers surrounding the fortress outnumbered its entire population at least five to one. The legion X Fretensis, probably under-strength from long years fighting the rebels, was accompanied by the auxiliary troops that always supported Rome’s elite soldiers in battle. Leading them was Flavius Silva, the governor of Judea. Roman governors always combined the roles of a bureaucrat, politician and general, leading local forces on campaign whenever trouble broke out. The entire army totaled over 5000 soldiers – less than these units could have mustered at the start of the revolt, but still quite a force. The Romans followed their usual practice when besieging an enemy settlement, constructing a line of circumvallation around Masada. This was a ring of fortifications facing the fort, preventing the defenders from getting out to seek help or launch counter-attacks. Built of stone and making use of the existing terrain, these walls were wide enough for guards to patrol behind battlements on the top, keeping a constant eye on the besieged. The siege line included six small forts, several towers and two larger military camps away from the mainline. Artillery emplacements allowed projectiles to be launched against any rebels who emerged. Its remains are one of the best examples of Roman siegecraft known to modern historians and demonstrates the incredible feats of construction a Roman marching army could achieve. The Roman defensive line also provided a place from which to prepare an assault. Coming within 280 meters of the fortress, it allowed legionaries to get close before emerging from cover and gave engineers a safe place to build machines close to the enemy. The Roman engineers were kept very busy. 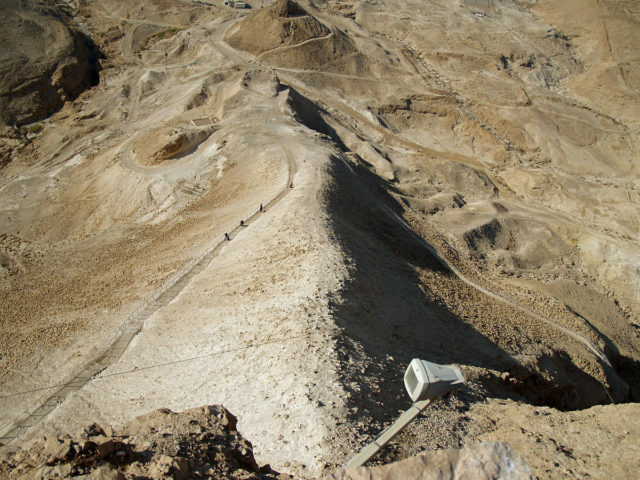 Using an existing rock spur as the base of their work, the engineers constructed a long ramp of dirt and rubble running from the Roman lines on the desert floor up to the top of the hill. Behind the lines, they built a siege tower containing a battering ram with which to attack. At last, the Romans were ready. The siege tower was wheeled up the ramp and the ram battered away at the walls, creating a weak point through which the legionaries would be able to attack. As they settled down to sleep that night, many among the Romans may have wondered who would be first through the gap the next day, and so earn the Corona Muralis, the gold crown granted to the first man over the walls at a siege, a military decoration of great prestige. But Eleazar Ben Yair and his followers had one last act of defiance left to them, one that would rob the Romans of their glory. Before the Romans could launch their attack, the Sicarii killed their families and then committed suicide. Instead of launching a fierce assault against desperate defenders, the Romans walked through the gap to find hundreds of dead bodies. The Jews had chosen to decide their own fates, rather than leave it to their opponents. With the fall of Masada, the last hope of the Judean revolt was crushed. But the memory of Masada would live on, becoming an inspiration to future generations of defiant rebels.